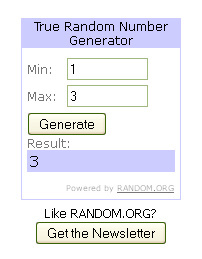 Time to announce the winner of the Copy-Kids Eat Fruits and Vegetables DVD! Yay, Caroline! Copy-Kids, will be sending you their DVD to get your child eating some yummy veggies and fruits soon! Thank you to those who entered. There will be more giveaways, crafts, and toddler fun coming up, so make sure you are following our blog via email (sign up form on the right side bar), Facebook, and/or Twitter to stay up to date with the House!